Praia do Boldro Beach, Fernando de Noronha, Brazil. Praia do Boldro beach is famously known as the Boldro beach. 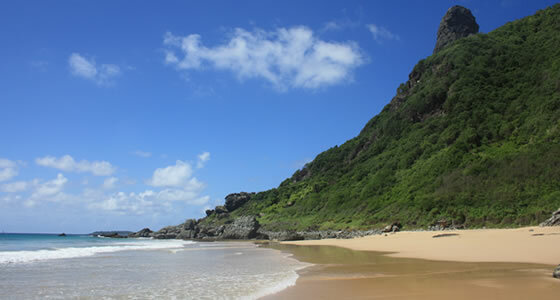 This beach is similar to the Praia do Conceicao beach but with a couple of exceptions. The beach is covered with very fine white sand and during low tide some of the sand stretches on this beach makes for a great walk. The sea here forms natural pools where you can enjoy swimming, especially during low tide or you can choose to watch a variety of colorful fish of different species. When the tide is high at the Boldro beach, the stones are completely submerged into the sea and hence can prove dangerous to swim; however, the high tide creates waves up to 5m high which is ideal for surfing. The waters of Praia do Boldro is dominated by flat and sharp coral reefs which can be explored if you go scuba diving, but can be dangerous if the water is turbulent. This kind of coral formation at Boldro beach helps the waves form good tubes for surfing. Another attraction on this island is the Sao Pedro do Boldro, a fort built during the 16th century. This fort is famous for viewing the sunset. You will find ‘Mirante’, a drink stand here but you have to be lucky enough to find it open, since the schedule is irregular.